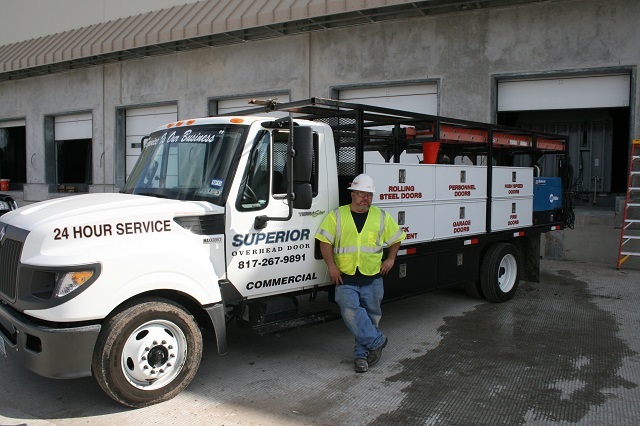 Superior Overhead Door was established March 1st, 1990 and has become a respected force in the business community. Goal: Provide the Best Commercial Service for the Overhead Door and Dock Equipment Industry. Specialty: Immediate 24HR Service on “ALL TYPES” of Doors and Dock Equipment. Company Vehicles: Provide Superior Equipment, outfitted with the finest tools available. We take pride in providing our employees the best technology offers. Personnel: Trained, Certified, Insured, and Experienced technicians. Overhead Doors and electric operators: door sections (panels), cables, springs, shafts, hinges, rollers, bearings, tracks, seal, chain hoists..
High Speed and High Traffic Doors: Includes service and install of most leading manufacturers, such as Dynaco, Hormann – Flexon, Albany, and Rytec high speed doors. Dock Levelers: mechanically activated, hydraulic activated, air bag activated. Vehicle Restraints: mechanical activating, hydraulic activating restraints, or air activating; including lighting (communication) systems. Metal or Wood Personnel Doors and Hardware. Post Protectors, Door Track Protectors, Crash Guards for pedestrian and equipment protection.